A newly discovered volcanic region in Antarctica has shocked scientists. The idea to study the area came from a third-year student. Some assert it’s the largest volcanic region on the planet as a survey showed 91 new volcanoes below ice which adds to 47 peaks above previously identified in Antarctica. The volcanoes range in height from 100m to a towering 3,850m tall. Geologists say the range has similarities to east Africa’s volcanic ridge, which was previously thought to have the densest concentration of volcanoes in the world. It is unclear whether the Antarctic volcanoes are active. 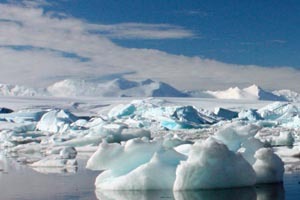 The project was carried out by researchers from the University of Edinburgh who remotely surveyed the underside of the ice sheet. Measurements from ice-penetrating radar were compared with satellite and database records, as well as information from aerial surveys. The idea to look for further volcanoes beneath the ice sheet came from a third-year student at the University of Edinburgh, Max Van Wyk de Vries. Dr Robert Bingham, from the University of Edinburgh, said the detection of the volcanoes could help them understand other rift systems. “Better understanding of volcanic activity could shed light on their impact on Antarctica’s ice in the past, present and future, and on other rift systems around the world,” he said. The study was published in the Geological Society Special Publications series and the full abstract may be found by clicking here. 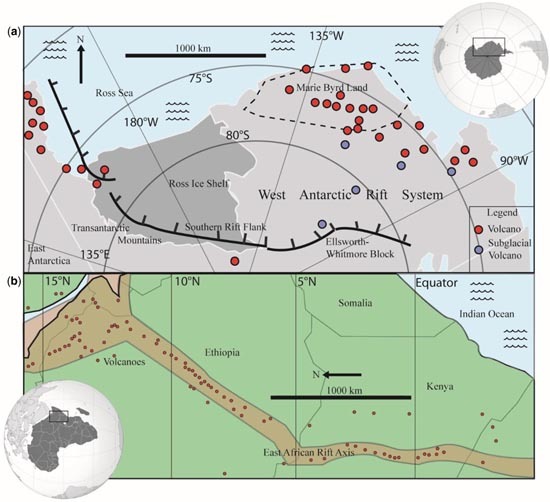 (a) Location of the main components of the West Antarctic Rift System and confirmed volcanoes (red circles: after LeMasurier et al. 1990; Smellie & Edwards 2016). (b) Location of Holocene volcanoes (red circles) in the Ethiopia/Kenya branch of the East African Rift (red shaded area). The majority of this activity is aligned along the rift axis with occasional flank volcanism. Data from Siebert & Simkin (2002) and Global Volcanism Program (2013). This entry was posted in Science on August 13, 2017 by admin.